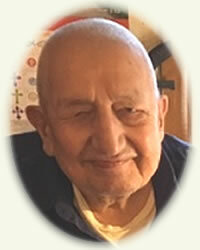 Obituary for Lawrence Fish | Rhoney Funeral Home, Inc.
Lawrence Fish a lifelong resident of the Tuscarora Nation passed away peacefully on Wednesday, April 10, 2019 after a full and adventurous life. He was 91 years old, born in Buffalo, NY on October 25, 1927, the son of the late Fred and Lillian (Henry) Fish. trip to Alaska with a friend. their home, where he still resided and continued to chop his own wood for his woodstove. A lifelong member of the Tuscarora Baptist Church, he was a brother in the Lord to the late Rev. R.
He was the son-in-law of the late Percy and Eleanor Patterson. Lawrence very generously desired to donate his body to UB Medical School. 2208 Mt. Hope Road, Sanborn, NY, with the Rev. Walter A. Printup, III officiating.